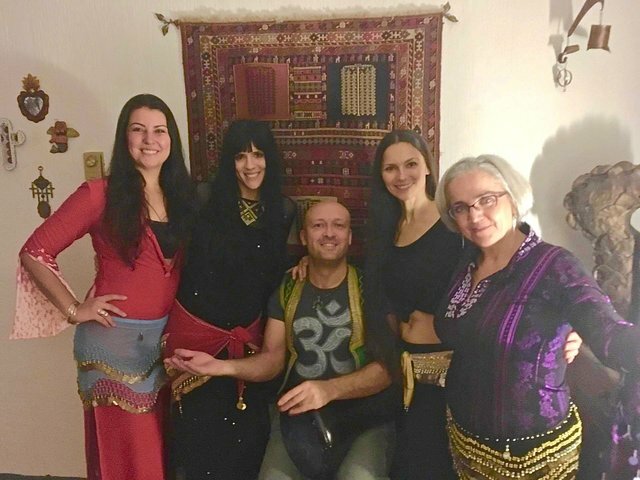 A Special Evening of Belly Dancing, "Bellyhood Consortium", featuring @eric-boucher on the doumbek! A Special Evening of Belly Dancing, Bellyhood Consortium, featuring @eric-boucher on the doumbek! Have you ever heard of the Arabic word “Hafla”? This signifies a “gathering”, “get together”, “party” or “ceremonious social event”. Though a bit immersed into the belly dancing communities in many areas where I have lived over the years, this passed weekend was the first time I was introduced to the term and what a gathering it happened to become. My partner, Taissia, and a handful of her students had prepared a special presentation showcasing the advanced students and herself. Meanwhile, I’d be the token live drummer, so to speak… Many names have been tossed around as to what could be the official groups name and so far one name seems to have stuck in my heart and soul: “Bellyhood Consortium”. The procession of guests, mostly women, one young girl and, @integra-mare and I, came with an array of foods from the crossroads of the Mediterranean; Olives, feta, figs, dolmades, etc. An assortment of delicacies from all over the world accompanied the main theme and, soon after the great majority of people had showed up, the foods and conversations were up roaring the early evening. Dispersed through the living room adjacent to the kitchen, laughters and sounds reflecting the levels of scrumptious tasting sustenance elevated themselves along with the resounding throb of Arabic music. For the newly acquainted with this sort of gathering excitement, joy and shyness combined with colluding spirits were exchanging looks among the experienced. For the latter, a palpable thrill was building. Not that anyone was trying to eat faster than their neighbours but there was a definite objective in mind: Dancing! At one point we must have been about 20, all packed in this small living room where music, warm vibes and joyful exuberance cooperated in a melting pot of cultures both socially and musically. The heat was rising and the energies building, the dancing solos had started and the group of women congealed as one forming as big a circle as they could, including all. Now that playfulness had set the pace within the group of women, the natural warmth and mutual recognition of womanhood rose to the surface while a celebration of their being emancipated itself and, like wild fire, spread over each and everyone present featuring one and two and three dancers at the same time within the confines of the small circle. As if the ring couldn’t bare its entanglement, the energy was brought out and lead into a spiralling snake by two of the leaders of the group, women who created a dynamic of group movement resembling a round of follow the leaders trailing behind them every single participants. I couldn’t contain my joy and excitement to have been part of this event, to my eye this resonated straight back to the very source of what we call today belly dancing with the celestial memories of countless generations of women who gathered over the millennia to rejoice in life, womanhood, dance and music, family, friends, and community dancing to and with each others’ recognition, all elements, their ancestors and the ones yet to come. Such lovely ladies & beautiful performance! I could never do that...When it comes to dancing, I am stiff as a wardrobe! And when I do try to dance and release the stifness, I can only imagine I look exactly like one of the Teletubbies. I could watch this all day and still be amazed! Namaste & sending you lots of love and light @eric-boucher. Again and as always, much light & love your way too, a great big smile and have a wonderful day. Most of the evening, I was outnumbered 18:1!!! OUTRAGEOUS!!! As it is often the case, the inner pain of having to suffer this magnificence will be leaving me crippled for life, eventually! Till then, do I ever enjoy!!! I know you understand the suffering and feel the sincerity of your empathy equally deeply. LOL!!! Wow @eric-boucher, my extreme compliments both for your drumming and for the lovely dancing. Very professional!! Something strange:While watching with my son, at the end of the video there was a man in the audience that said "yaaaah" and then "well done". WE were both convinced that it sounded just like me! Am I a time traveler? <3 I love those dances, they are fantastic, I really enjoyed it, it made me want to dance and everything. excellent. Your joy and excitement is palpable through the electronic highway and it is a great pleasure to be able to share this with you. You compliment is warming my heart and I will be able to share the comment with all the ladies tomorrow. No doubt, they will be flattered and even more motivated by your kind words. So much gratitude for your presence of heart, fellowship and kindness of spirit. Maybe Taissia will end up making tutorial through Steemit one day, if she can get access to a blog site!?! Meanwhile, I gladly make the videos and give her and her students exposure here. Thank you so very much, your enthusiasm is a major compliment and the genuine kindness you come from is delectable. They will appreciate. How nice this is! I hope you had a super great time. The bellydancing is cooll but your drumming is certainly as cool! You have super rhythm. Do you play in large drum ensembles as well? Improvisation for instance? I always love it when I'm eg on Ibiza on Benirrás beach to listen to the drummers playing at sunset times. We sure did have an amazing time, thanks! The next video will also underline the fun we've had. Much gratitude for your kind words in relation to drumming as well. I have drummed over 30 000 hours in my life, so far, and have played with styles and rhythms the world over, this was a little taster. the next video relating to this specific evening has more of my improvisational skills rising as I do so along with Lynette, the owner of the house who is an excellent dancer too. I improvised with over 200 people at one point, what a blast that was, not to mention the countless hours of drumming among groups of musicians and drummers. 30.000 hrs: WOW! That is a LOT of hours! And improvised drumming with a group of 200 drummers, that must be an amazing event! I'm looking forward your next videos. This kind of drumming I really like! Benirrás Beach: Indeed live! And not a fixed ensemble, everyone with a drum can join in. Sometimes it is a small group, sometimes a large group. It usually take them a bit of time to get in exact the right rhythm, I suppose since some of them are not super experienced. But it is surely great to experience, I dont live their, but spend from time to time vacation on this magical Island. I can advise you a vacation on this island. There is such a thing as "overdrumming", and depending on the techniques used, one can seriously hurt themselves for life... Anyway, I'm glad you enjoyed the drumming. You are very blessed to be able to go to this island of beauty and spend time along with the elements while inspiring music plays along. I'd surely be there right in. Thanks for sharing! overdrumming: I can imagine, some seem to use a lot of force and RSI can lurk around the corner I suppose. It often seems like we are hitting hard, but doing so will in deed damage your body on the ling run. Hitting properly will still be heard loudly and clearly though it will seem from the person looking that you are hitting it hard. The trick is in the "whip". Just like when you play badminton, it is the whipping of the wrist that allows for the birdy to be smashed with swiftness, the the hard and strenuous attempt at moving the arm forcefully. Constantly moving in terms of circles helps a great deal in not having to move against your original impulse and thus a flow builds with which the drummer can dance along its breathing and dance. Wow, thanks a lot! I'll be sharing the comments and replies with the ladies over the course of tomorrow. I love the emoticon here and there, it is both colourful and joyful, loving'em! What a wonderful group! The older dancer has my attention. Such a vibrant spirit! It put a little more "kick" in my stride this morning. Thanks for posting! Well, I'm sure she will be pleased to read this comment of yours. The group is in deed quite something and has loads of potential. what a pleasure it has been for me to drum for them and witness the growth of their spirit as well as being part of it too. Thanks for the wonderful comment! thanks for sharing @eric-boucher, wonderful article about belly dance, picture is nice and video is outstanding.good work. you are so blessed!!! Beautiful!!! Thanks @teresa-robinson! I completely agree with you and feel the same, I am greatly blessed, leaving me almost nothing else to say but to smile! Great work, you've lifted me right up, early on Sunday morning. Deep thanks! Excellent Dance. A good music played by Doumbek. I like that moves of hair. That up and down. well w ell. Checkout my latest post @aonraza its about a visit(travel). Good sample, have fun over there.